Many people are overwhelmed with the term “home theater system”. For them, a home theater system costs a lot of money with all the advanced video and audio devices such as large HDTVs and sophisticated speaker systems. But with the advent of more and more brands of home theater systems, the price drops. The sophistication of a home theater system depends on your level of satisfaction and budget. It is true that the best home theater system is composed of the largest, ultra high-resolution TVs and powerful speaker systems. But there are also inexpensive brands and models that you can easily own. Of course, whenever you buy something, you should consider some factors. When it comes to home theater speaker systems, the most common is the 5.1 channel surround sound. It is composed of 5 speakers and 1 subwoofer. It is more affordable and generates good sound quality. The speaker system should provide crisp, distortion-free sounds. A powerful bass is a good consideration too. There are several types of speaker systems in a typical home theater system – the sound bar, home-theater-in-a-box system, component system, and component separates. The Monoprice 10565 Premium Home Theater System is a 5.1 channel speaker set providing a real surround sound. It is composed of 4 satellite speakers and one middle speaker that features a 3-inch polypropylene mid-range driver and a ¾-inch dome tweeter. All the speakers are in small sizes and lightweight so they’re easy to lift up and mount with the use of a universal ¼-inch threaded insert. The Monoprice 10565 Premium Home Theater System is energy efficient. It is powered by 100 watts. The subwoofer that comes with this speaker system measures 8 inches and weighs 20 pounds, built with 4 big rubber feet to minimize vibrations on the floor. It features speaker level and line level stereo input so you can pair it with any amp. The subwoofer has a phase control switch so you can fine-tune the subwoofer phase based on the settings of the rest of the speakers. The Monoprice 10565 Premium Home Theater System is easy to install through the spring loaded speaker terminals, universal mounting choices, and a small lightweight style. It comes at an affordable price without compromising a theater-like experience. The Monoprice 10565 Premium Home Theater System boosts sounds in ways that are similar to the expensive surround sound systems. Having a great home theater speaker system gives you a theater-like experience at your home. It is the major factor that provides the home theater system a complete feel. The combination of speakers and a subwoofer work together to boosts the sounds of movies, TV shows, game consoles, music, etc. However, many speaker systems are very expensive. While many of these expensive speakers provide the highest sound quality, many people can’t afford it. Fortunately, the Monoprice 10565 Premium Home Theater System is a very affordable 5.1 channel surround sound system that provides good sound quality. 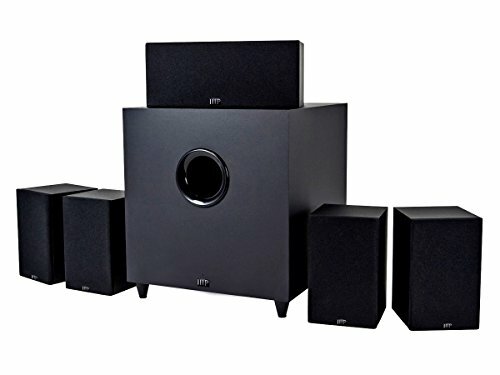 The Monoprice 10565 Premium Home Theater System is composed of 4 satellite speakers, 1 center speaker, and a subwoofer with rubber feet to prevent floor vibration. All these speakers work together to provide powerful, clear sounds of different TV shows, movies, music, and game consoles. The subwoofer comes with a phase control switch on its back so you can adjust its settings based on the settings of the other speakers. You can adjust the sound quality based on your preferences or the kind of entertainment show you have. It is lightweight and easy to install. To generalize, the Monoprice 10565 Premium 5.1 Channel Home Theater System is pretty decent 5.1 channel surround sound system that does not break the bank. It is a good alternative if you want to upgrade your old sound system. What are you waiting for? Buy it now and have a better home theater system.